The exhibitors screen is used to enter individual exhibitors. It is the starting point of the show and the system. Before any exhibits can be entered there must be an exhibitor.It is only necessary to enter an exhibitor once, even if they have entries in both the open and junior shows. The fields for the exhibitor are self explanatory. The email field is necessary if the show is sending email confirmations later on. Only exhibitors that have exhibits will display on the printed exhibitor's list. Once exhibitors are entered, the information can be use to enter exhibits, The exhibitors information can be used to print mailing labels. Show lists entered ahead of time too. Once entered the exhibitors can be copied, year to year or edited as necessary. The system will prevent a dependent exhibitor from being deleted. If an exhibitor has entries and you accidentally hit the delete button, the application will not allow the deletion until the dependencies are removed. IMPORTANT: Double check spelling of the exhibitor's names. The add exhibitors screen is used to add individual exhibitors. The information entered on this form will be used for the Exhibitors List. 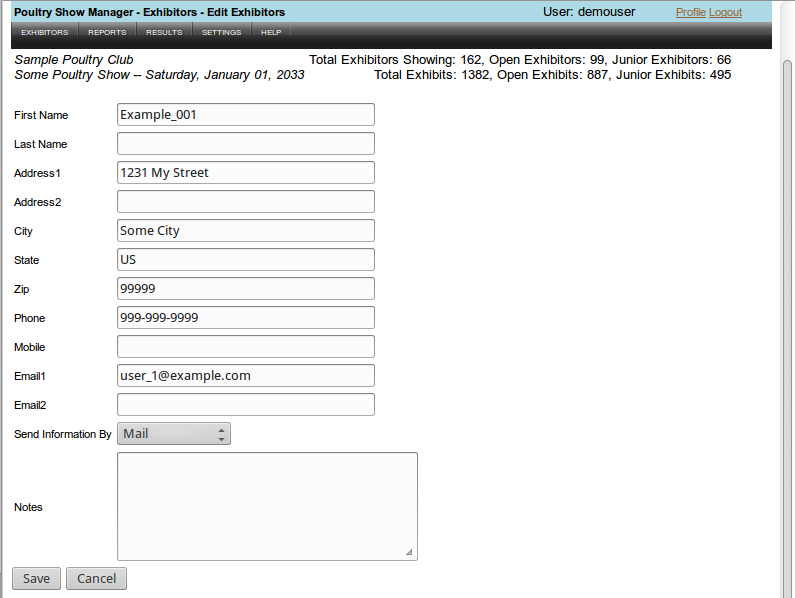 The fields for the exhibitor are basic contact information fields. When entering data, remember that the fields are sorted by lastname then firstname when printing on the Ehibitor List. If the exhibitor goes by a a business name then enter the business name as the last name to insure sorting results print as expected. To save the information click on "Save" when finished adding information or click on "Cancel" to discard changes. The edit exhibitors screen is used to edit individual exhibitors. 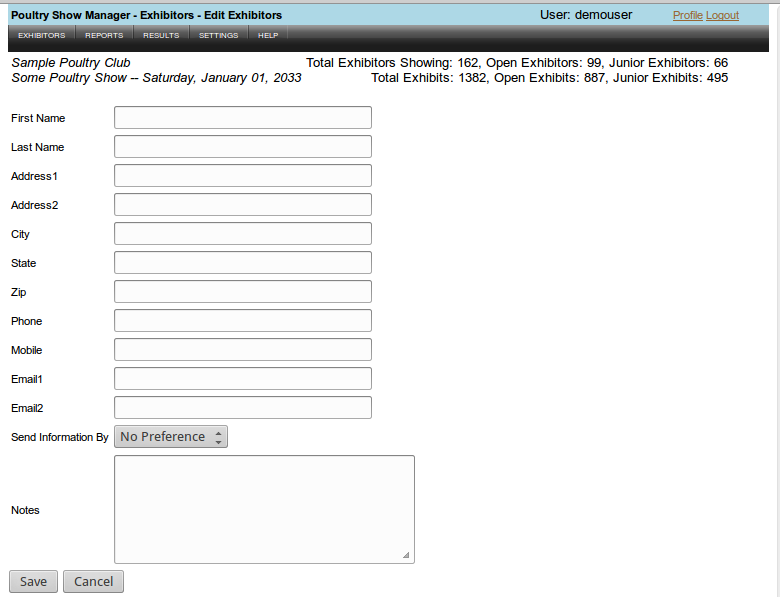 The information entered on this form will be used for the Exhibitors List. To save the information click on "Save" when finished editing information or click on "Cancel" to discard changes. 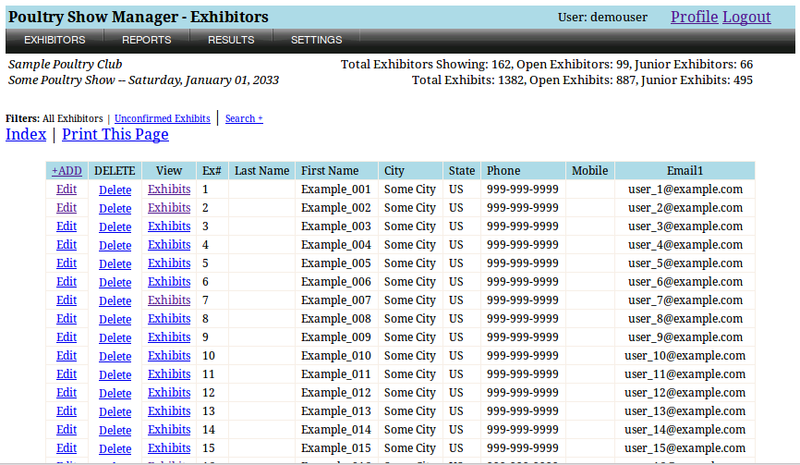 To delete an individual exhibitor click on the "Delete" link on the row to delete. The application will ask if you are sure. If there are entries dependent on this exhibit, then the software will not allow it to be deleted until the dependencies are removed.